The Vietti children have attended the Gasse School of Music for over six years. 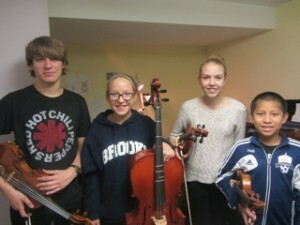 Gabriel (16) and Sabiano (10) take viola lessons with Sarah Gasse. Sarah also teaches Siena (14) violin. Dr. Daniel Gasse teaches Aliana (13) cello.The oldest two children started playing string instruments when they were 6 and 7. The other two started when they were around 8. After many years of lessons and practice, the children will play for the first time together publicly at our November recital. In addition, Gabe and Siena are playing for their cousin’s wedding at City Park in New Orleans in November. With the wedding being outside, their cousin had decided she wasn’t going to have ceremony music. However, when she heard her cousins were able to play many wedding song favorites including Jesu Joy of Man’s Desire, she was so excited. Thanks to Sarah’s help the kids have a full compliment of wedding songs to play.